I feel like it would be a lot easier to sum up the all-new Volkswagen Golf TDI had I spent the last six months on some sort of self-imposed media blackout, not reading foreign road tests, not listening to industry chatter and certainly not paying attention to the various awards that have been doled out to VW’s perennial hatch since its launch earlier this year. However, due to what can only be called ‘unavoidable career obligations’, such a hiatus was never a realistic possibility. And much to my misfortune, the household time machine is broken, so I cannot un-consume what I have already heard about the new Golf; mainly, that it was crowned 2009 World Car of the Year. Expectations, to say the least, currently reside somewhere in the Thermosphere. I mean, World Car of the Year? The thing already sounds like some kind of brazen superhero. 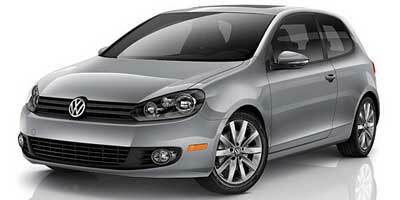 Now in its sixth generation, the new Golf is very similar in size and shape to its predecessor. Penned by Volkswagen design chief Walter de’Silva – who, amongst other famous products, was responsible for Audi’s stunningly 21st century R8 – the car now has more horizontal emphasis to it, creating a car that looks wider and more surefooted, even though the actual dimensions tell a different story. It’s also more aerodynamic. Inside, a lot of work has gone into addressing issues consumers had with the Golf V’s perceived interior quality. The result is a premium feeling cabin that comes across as more Audi than Volkswagen, which is another way of saying that it’s quite modern in its design. Attractive gauges flank a multi-function display and the center stack is dominated by a touchscreen audio system that sports satellite radio compatibility as well as a USB interface for the ubiquitous iPod demanded by the modern day commuter. The touchscreen comes standard, though keep in mind adding navigation will cost you some extra coin. Under the hood lies Volkswagen’s panacea to ever-stricter fuel economy and emissions regulations, the clean diesel TDI (Turbocharged Direct Injection) engine. Thanks in part to the availability of Ultra-Low Sulfur Diesel fuel (ULSD), modern diesel engines burn up to 25 percent cleaner than their gasoline counterparts, not to mention up to 30 percent more efficient. In short, they’re a far cry from their cloud churning, sounds-like-a-spoon-in-a-garbage-disposal ancestors made so infamous by various 1980s Mercedes-Benz models. 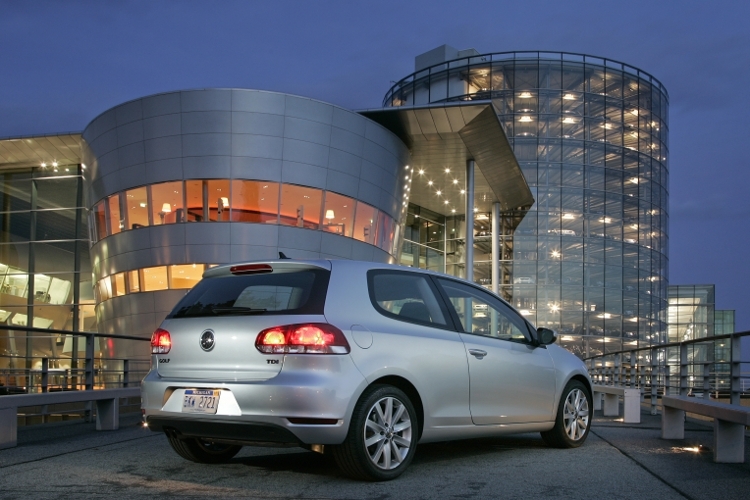 The Golf TDI utilizes the same 2.0-liter common rail, direct injection turbocharged diesel engine as last year’s award-winning Jetta TDI (if none of that makes sense to you, feel free to skip to the next paragraph; if it does, get another hobby). It’s good for 140 horsepower and 236 lb-ft of torque, and when paired with a six-speed manual transmission – you know, those do-it-yourself things Americans hate – it can manage an impressive 30 mpg city, 41 mpg highway. Volkswagen has also decided to offer a six-speed Direct Shift Gearbox (DSG) automatic which, without boring you to death, is more efficient than traditional automatics because it uses two clutches for ultra-fast shifting. The upside to it all? 30 mpg city, 42 mpg highway. Plus, you get nifty paddle shifters and a cheery tax credit from the Fed. So basically, this is Volkswagen’s unofficial hybrid fighter. Think Toyota Prius and Honda Insight. As such, you wouldn’t be completely off the mark assuming it drives like a couch and hates fun more than the Emperor from Star Wars. You would, however, be very wrong. Unlike mainstream hybrids, which mostly use continuously variable transmissions (CVTs) to deliver power in that tediously slow-to-react, rubber bandy fashion, this is an economy car that drives like its familiar gasoline-powered counterparts. Ask anyone who has ever pinned it in a diesel and they’ll likely tell you these engines have a tendency to feel a lot faster than they actually are, due to the immediacy of the low-end torque. You get a big thud in the back even at low revs and in this respect it doesn’t feel that much different than VW’s own feisty-yet-polished GTI. In fact, if you were wearing earplugs and didn’t have a tachometer for reference, based purely on power delivery it would be difficult to tell a difference between the GTI’s 2-liter turbo and the oil-burner in the TDI, a statement I’m sure will have some of you petitioning to have me committed to an asylum. But torque has a sinister way of playing tricks on your senses, and the reality is much different. In the TDI, 0-60 mph comes up in a claimed 8.6 seconds, nearly two full seconds off the GTI’s 0-60 sprint of 6.8 seconds. At a glance, a 1.8 second differential might not seem like much, but in the automotive world that’s quite a gap. For reference, Volkswagen Group’s flagship supercar and destroyer of worlds, the Bugatti Veyron, can get to 60 in just 2.5 seconds. In other words, the TDI is no drag racer. In classic European fashion, however, this is one tightly put-together grocery getter. It uses the same general suspension layout as the GTI, with sport-tuned McPherson front struts and a four-link independent rear. 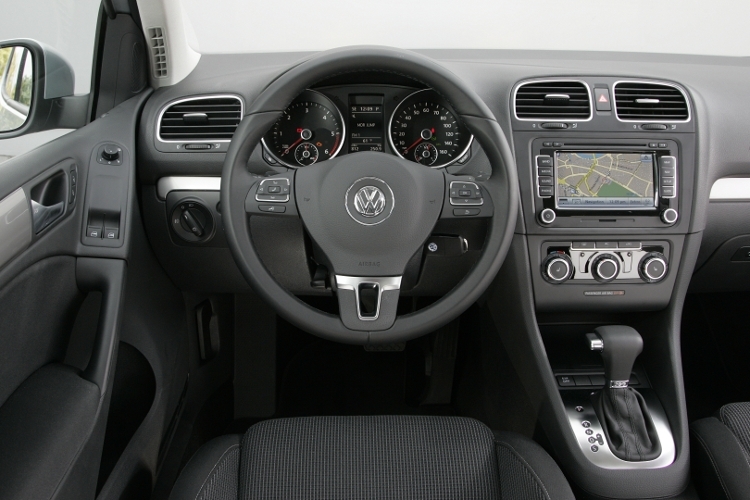 This makes for a ride that’s firm and controlled, and when paired with the Golf TDI’s weighty steering, they conspire to create a car that is fun to push through the corners. I mean that quite literally. Prod the ESP button to deactivate the electronic nannies and with all that low-down torque, the front wheels will spin up quite easily in anything but completely dry conditions. Be a little more ginger with the throttle and understeer becomes a non-issue. Of course, with ESP on – it comes standard, by the way – the car will do its best to keep such mischief to a minimum. But it’s nice to know this thing has a bit of an untamed side, even if it is front-wheel drive. Just try laying a burnout in your Prius. I’ll check back next week after you’ve melted your regenerative brakes. Let’s set the record straight – this is no performance car. But just because its parts don’t come from the bin marked ‘motorsports department hand-me-downs’ doesn’t mean it has to be boring to drive. And that’s what the Golf has always been about – simple yet entertaining motoring. Both two- and four-door versions are available, with pricing starting at $22,189. Factor in a tax credit thanks to the diesel engine and that figure drops by $1,300 and $1,700 for the manual and automatic respectively. 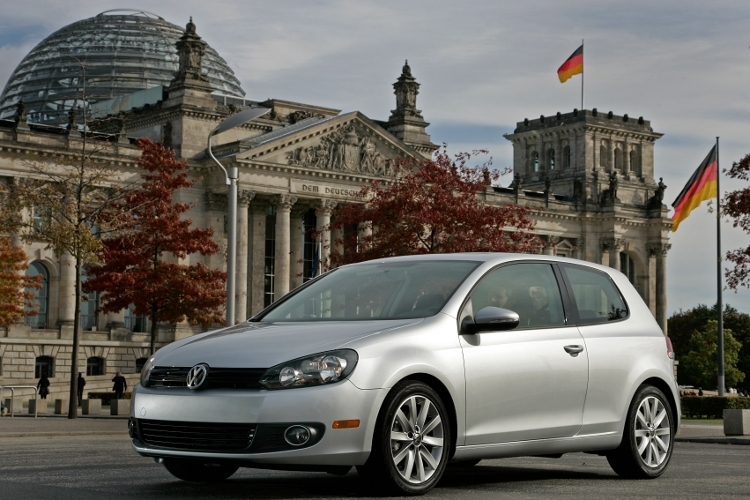 In a way, the 2010 Golf TDI represents the other side of the fuel-crisis coin. And in my opinion, it’s the better avenue for gearheads. Diesel motoring delivers familiar sensations and transmission options are not as yawn-tastic as those offered on electric vehicles and hybrids. Sure rev-tastic, high-horsepower concessions have to be made, but hope is far from lost.